not for profit, financial cooperative dedicated to the financial well being of its members. Low cost financial products and services, including the personal attention given by our staff of professional union members. Union Building Trades Federal Credit Union was chartered in July of 1973, and its primary membership was a regional IBEW electrical union. Today Union Building Trades FCU serves various unions within the building trades such as electrical, plumbing, pipe fitters, and many more, with new unions seeking membership. members and their families already a part of the Union Building Trades Credit Union family. If you are using a screen reader and are having a problem using this Web site, please call 800- 848-2438  for assistance. 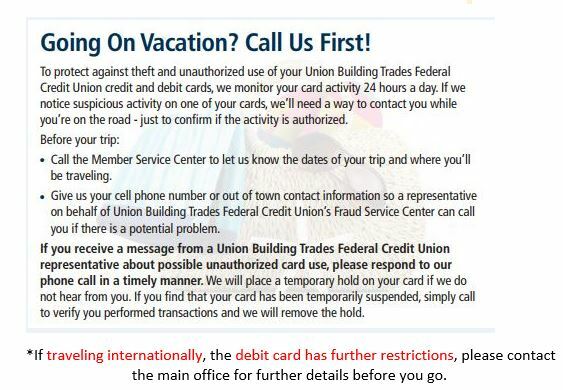 Copyright © 2019 Union Building Trades Federal Credit Union. All Rights Reserved.